Creating Smiles with every Stitch. 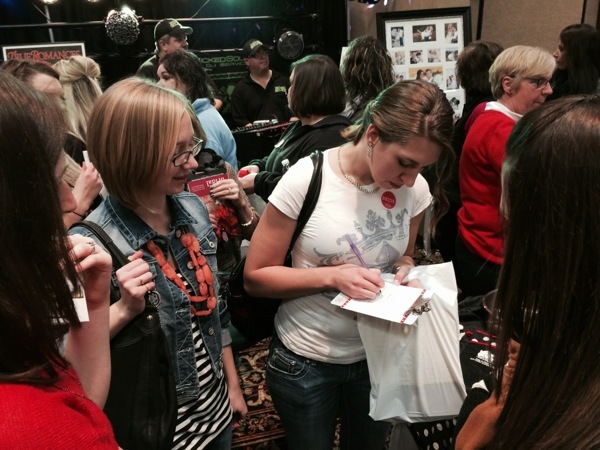 Sunday was the Everything Bridal Show at the HyVee conference center. A place where vendors come together to make their pitches to newly engaged couples and where couples learn about the available services and can make decisions about who and what they want for their wedding. Normally, I'm on the other end of these vendor-bride relations, but this time, I had the opportunity to be the bride and experience the show for myself. I have five awesome bridesmaids that all got together to help me make these decisions and came to the show with me. We had a great start to the show after parking. It was so busy that we parked a ways away, but one of the limo companies was running rounds around the lot and gave us a ride to the front door. We felt a bit like celebrities with the special treatment. After receiving my "bride to be" sticker and registering for door prizes, we plunged into the crowd and began our search for a photographer, a florist, and a cake decorator. It was a good thing that I had these goals that I was looking for, because the number of vendors at the show is a bit staggering. It can be rather overwhelming to have to wade through a crowd and you see three bridal shops, a caterer and two hotels in a row, none of them being a vendor that you necessarily need. On the other hand, looking down an aisle and seeing five photographers in a row and thinking that you need to talk to all of them, can be a headache as well. Luckily for me, I had my maids to help me out. They talked to some, I talked to some, and we compared notes at the end. In this way, I was able to come up with a couple favorites in each category. All in all it was a really fun say. I was really happy to spend this time with my bridesmaids and I think I found exactly what I was looking for. I'm getting very excited for my wedding and I can't wait till the big day. I do recommend that if you are planning on attending a bridal show, have a list of what you are looking for. This can really make it easier to get through the show so you aren't overwhelmed by talking to everyone there. But don't forget to take it slow and check out the caterers and hotels. Some of them bring great food, and you may find a great restaurant that you didn't know existed, plus the hotels often have great drawings. You could win a trip or a romantic weekend stay. So keep and open mind and don't forget that you're there also to have fun. Enjoy it while you can!